I can remember my first mobile phone from Samsung. It was a Omnia PRO B7610. I was wandering about that this phone could only be charged when it was connected to a powered on PC. All other USB chargers didn’t work with this phone. The only possibility to charge the Omnia seems to use an original Samsung charger which was expensive. I decided to save my money and do some investigations. On my way through the USB universe I found out, that the USB specification defines that USB charger should use a short circuit on their data pins in order to identify themselves as non-intelligent chargers. You need a soldering iron, solder, a few screwdriver, maybe a cutter and a multimeter. Open your USB charger and find the 4 pins which connects the usb port to the charger. After that you have to solder the middle 2 pins together (see the red curl on the following picture). 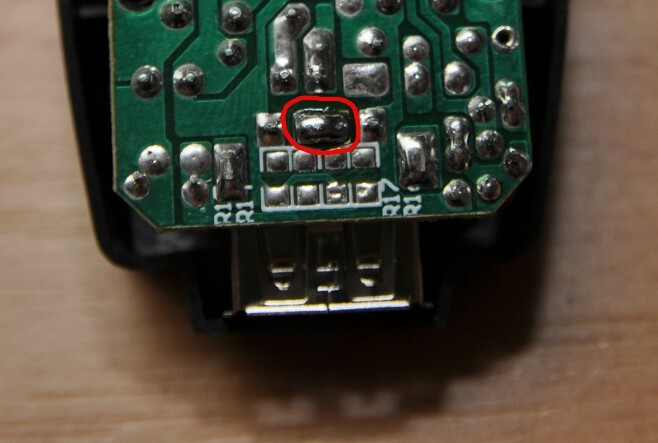 You should check with your multimeter that the solder does not affect the outer pins. Now your Samsung mobile should charge on your cheap USB charger very well. After you have tested this, you can assemble the charger. I’ve heard that other mobile phones have the same “features”, so this may work with these mobiles too.